shyness comes bubbling up the spiral stairs. Translated from the Korean by Chung Eun-Gwi and Brother Anthony of Taizé. Kang Unkyo is a poet and professor of Korean Literature at Dong-a University, Busan, Korea. She got her bachelor’s degree in English Literature and Ph.D. in Korean Literature from Yonsei University. Kang made her literary debut with the publication of Night of the Pilgrims (Sullyejaui bam), which earned her the 1968 New Writer Prize, sponsored by the journal World of Thoughts (Sasanggye). She was a member of the coterie that published the The Seventies (Chilsimnyeondae). Her poetry collections include House of Nothingness (Heomujip), Diary of a Pauper (Binjailgi), House of Noises (Sorijib), Red River (Bulgeun gang), Song of the Wind (Baram norae), Song of Sadness (Seulpeun norae), and Letter in the Wall (Byeoksogui pyeonji). Kang was also the recipient of the Korean Writer’s Prize and the Contemporary Literature Award. Chung Eun-Gwi is a professor of English Literature and Culture at Hankuk University of Foreign Studies. 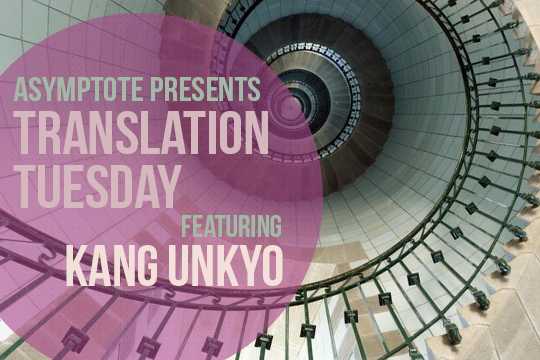 She specializes in twentieth-century poetry, Asian American literature, translation theory and practice. She got her Ph. D at Poetics Program, State University of New York at Buffalo in 2005. Her publications include articles, translations, poems, and reviews in various journals such as In/Outside: English Studies in Korea, Comparative Korean Studies, World Literature Today (USA), Cordite (Australia), as well as several book chapters on poetics. Eun-Gwi has translated lots of contemporary Korean poetry into English including Fifteen Seconds without Sorrow by Shim Bo-seon (Parlor Press, 2016) and The Colors of Dawn: Twentieth Century Korean Poetry (Hawaii University Manoa Press, 2016, co-translation with Brother Anthony). Brother Anthony of Taizé has lived in Korea since 1980. He is currently emeritus professor at Sogang University, and chair professor at Dankook University. He has published more than 40 volumes of translations of Korean poetry, and of several novels, for which he has received a number of awards. His Korean name is An Sonjae.